The humble dog crate is valuable at every stage of your pup's life - from the early days of learning to go there to sleep to having a private home of their own as they grow, it's always worth having one. That said, some brands of dog crate are distinctly better than others. Here's our list of the best dog crates. Before we get to that, though, we need to take a look at the types of crates on the market and how we decided which crates to include on this list. There are five different types of dog crates currently on the market. Wire crates have plenty of airflow and good visibility, making them the ideal choice for dogs who like to see their surroundings when they're relaxing. 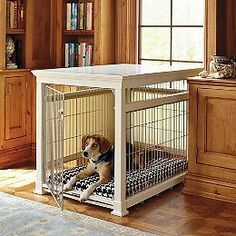 They're a little better for dogs that aren't determined to escape from them, too, since wire crates aren't quite as sturdy as most of the other models. While not especially attractive, visually speaking, wire crates are easy to clean and often come with removable panels you can take out as your dog grows. Some types of wire crates can be collapsed to make them easier to move around. Plastic crates are a better choice for dogs that like some privacy. They're also considerably more durable than wire crates, making them harder for dogs to escape or bite through. Many people prefer them for air travel thanks to the hard sides, and most plastic crates come apart in the middle for easy storage. Unfortunately, there is a bit of a tradeoff here. Since the sides are harder, there's not nearly as much ventilation. That can be a problem if your pup is especially warm and needs to cool off (though a fan might help). They're also harder to clean when they get dirty - not horribly so, but enough to be worth noting. 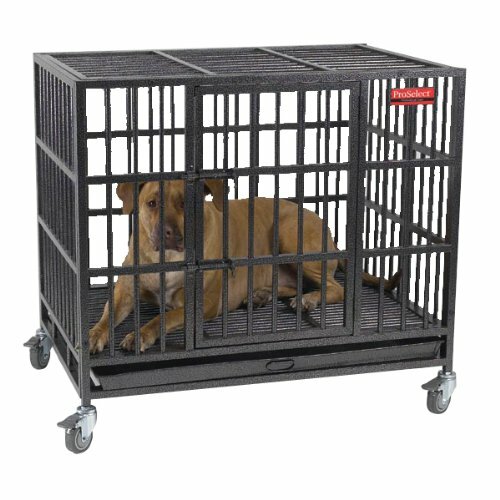 Soft-sides crates are ideal for small, gentle dogs. Since much of their structure is cloth, they're lightweight and easy to move around. Unfortunately, even the toughest fabric won't last long against a dog determined to chew through it, and like plastic cages, they're somewhat hard to clean. Together, these traits make soft-sided crates a poor choice for any mid-size or larger pup. Heavy-duty crates are the opposite of soft-sided crates. They're intended for larger, more destructive dogs, and chances are they won't be able to escape or ruin the sides. 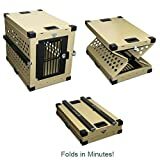 Like plastic crates, heavy-duty crates are often approved for airline travel, so they're a good choice if you'd like to travel with your dog on a regular basis. The main downside to heavy-duty crates is the cost. These crates usually cost several times more than other crates, although you'll still save money in the long run if you don't need to replace the cage over and over. 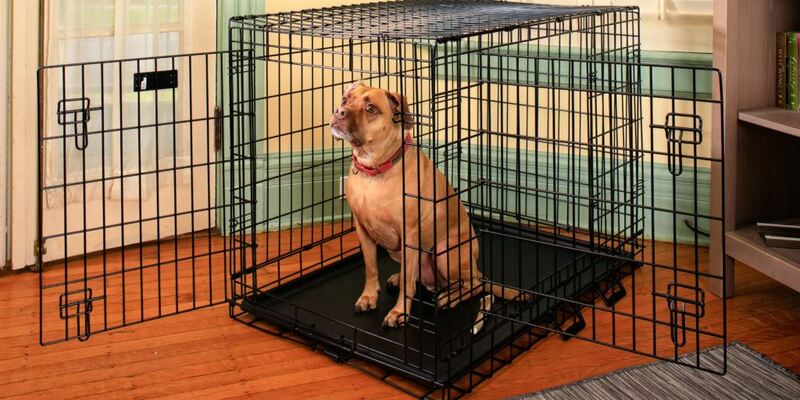 If your pup is from a destructive breed, consider going for this type of crate first. Finally, there are fashion crates. These are more about appearance than practicality, and they often have a wood or rattan finish. Some of them are durable enough to function as a side table when put next to a sofa, offering an impressive secondary function. As wood products, these crates are easily damaged by destructive dogs. You'll also want to have a thick liner on the inside in case there's an accident. Pricing varies, but fashion crates tend to cost about the same as a heavy-duty crate, which they otherwise resemble. We considered several factors when deciding on our final ratings. First, we looked for information on how many people had bought the crate and what they thought. When you have hundreds (or thousands) of people agreeing that a dog crate works, that's a strong point in its favor. The wisdom of the masses is worth considering on topics like this. Next, we looked for different types of crates. Sure, we could give you ten different wire crates that are all practically the same - but that's not very helpful. Different pups (and families) have different needs, so we decided to ignore what were basically duplicate cages in favor of variety. After that, we looked at the additional features of each crate. Wire crates are fairly straightforward, but some of the other crates we looked at offered rare or unique features, and we valued these above the base models. This includes their ability to travel, as explained on PetTravel.com's excellent guide to the subject. Finally, we considered the sizing of the crate and how many different breeds they were suitable for. In general, we preferred large crates to smaller ones - a small dog can make good use of a large crate, but the reverse is not true. Many crates are available in multiple sizes, so this wound up as a fairly minor - though still important - factor in our final list. Now that you know more about the types of crates and how we chose our ratings, let's take a look at the crates themselves. It's hard to doubt the wisdom of more than 8,400 reviews, especially when 90% of them are positive. This wire crate offers front and side doors, which make it easy to position things and access the inside. Each door comes with two slide-bolt latches, which are sufficient to keep most pups secure. Meanwhile, the exterior is made of metal, rather than the plastic seen on some other crates. 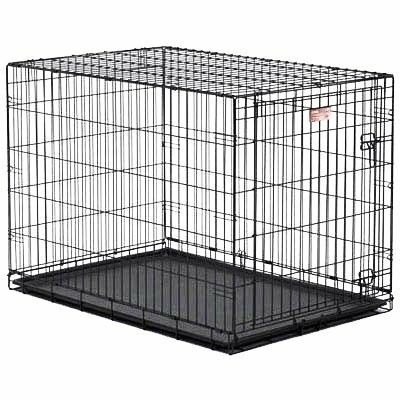 Rounded edges make this safer, while an included divider panel makes it possible to 'expand' the crate as your pup gets bigger. A removable plastic pan sits in the bottom of this crate, and the entire thing folds flat for easy movement. Petmate's plastic kennel is a great choice for air travel - though, as always, you'll need to check with individual airlines to be sure. There's really no way to get around that, though. 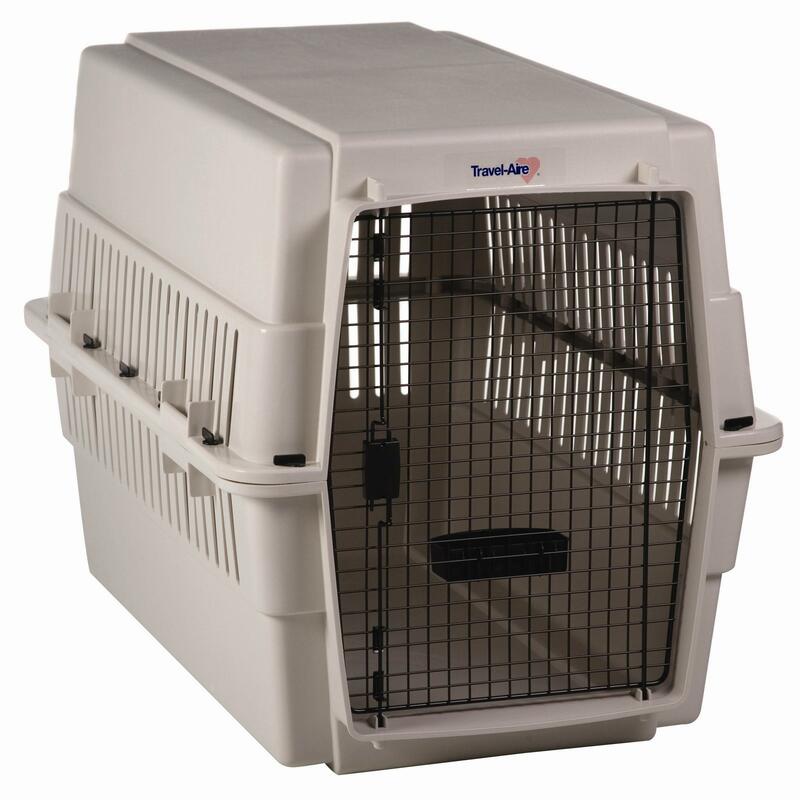 This kennel comes in four sizes and is suitable for pups ranging from 25 to 90 pounds. 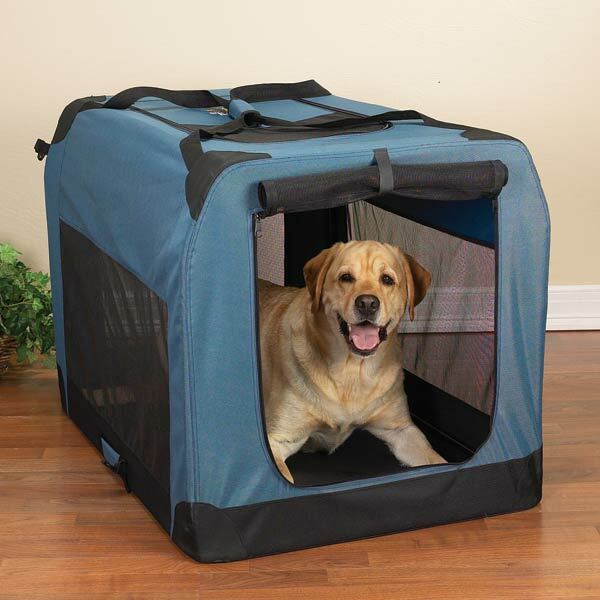 Smaller dogs can use this kennel, but you may need to add extra padding so they can't be thrown around too much. The outer shell itself is easy to assemble and comes with holes that can lock or zip-tie the pieces together. This provides added strength and security during travel. Meanwhile, the single door features a squeeze latch that's extremely difficult for most dogs to open from the inside. Like all plastic kennels, this choice has limited airflow, though the large wire door mitigates the worst of that. It also has surprisingly generous openings on the side and top. These provide better airflow than many plastic kennels without compromising the structural integrity of the crate. If there's one major downside here, it's that this kennel is visually bland and unattractive. If you are going traveling with it, it's worth looking for ways to help it stand out a little more so you can find it when you need to. Pricing ranges from $70 for the smallest version to $140 for the largest, but some of the sizes are often on sale for less. At the time we checked, the smallest version was discounted to $50, making it a pretty good deal for the quality of crate we're looking at. Slightly odd name aside, this is easily one of the best soft-sided crates on the market. The ventilation isn't quite as good as that of a wire crate, but it's still much better than any plastic, heavy-duty, or fashion choice. Since the sides are soft, it's easier to add doors - this particular model has top, side, and front exits for your pup. Meanwhile, the all-steel frame ensures the crate itself is durable enough to withstand years of use, even if the cloth needs to be replaced now and then. Since the material is foldable, this crate is washer-friendly and easier to clean than most other cages. Overall, this is a solid choice for smaller, non-destructive dogs. Pricing ranges between $50 and $80, based on the size you want, with the two versions being suitable for up to 40 and 70 pounds, respectively. 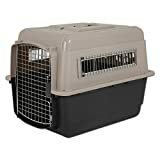 Sometimes you need a dog crate that's more durable than the rest - and that's where this product comes in. As a collapsible crate, it's surprisingly portable, but the real value is in the solid aluminum siding. When you mix in the powder coated finish, the cage helps reflect heat instead of trapping it inside. Meanwhile, the aluminum itself is essentially escape-proof, and it comes with a slam latch that automatically locks into place. Meanwhile, the rounded square openings offer plenty of ventilation and the feeling of having a line of sight, which helps to calm dogs and keep them from stressing out about things they can't see. The sticking point on this dog crate is the price. At the time we checked, it was retailing for $800, and similar products from other sellers are about the same. You're going to get what you're paying for, but make no mistake, this is a serious investment. 27.5L x 20W x 24.5H in. This wooden crate is the ideal blend of furniture and dog crate, with a wood-and-metal construction that's durable enough for most pets' needs. 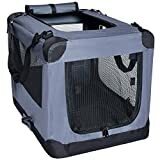 It can also have a water bottle installed on the side, which is something of a rarity in sturdier pet crates - and probably worth doing. This table comes in four sizes, for dogs ranging from 20 to 100 pounds. Your pup probably will jostle it a bit when they get in and out, so we don't recommend putting anything too fragile on top. The biggest downside to this crate is that it's not especially suitable for travel. It is, however, much more affordable than a true heavy-duty crate. When we checked, the official price ranged from $190 to $234. 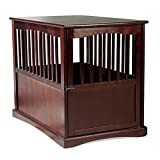 However, all sizes were on sale for about 50% off, making them an outstanding deal if you're looking for an end-table as well as a dog crate. There are two things to consider when buying a dog crate: What does your dog need and what can you afford? Heavy-Duty crates are, by many measures, the best choice. They're suitable for travel, sturdy enough to keep the most destructive breeds safely inside, and probably won't need to be replaced. The only major downside is the cost, which is often between 5x and 8x the cost of a simpler dog crate. If you can't afford the best, focus on what makes the most sense for you. Many dog breeds do just fine with wire crates, which are durable, affordable, and easy to clean. They're not the best choice for particularly destructive breeds, but in most cases, they're just fine. If you plan to travel, get a plastic crate instead. These are generally suitable for flights, and it will be less stressful on your pup if they can stay in a crate they're used to. You don't want to put them through the stress of flying without something familiar to keep them calm. Soft-sided crates should be avoided unless you know your pup is calm enough to avoid destroying the sides. Even the best soft-sided crates are less-durable than any other style. 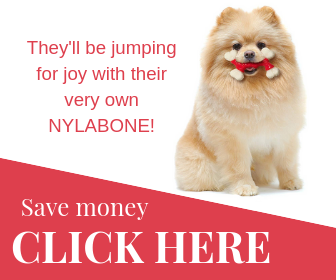 « Top 5 Best Bark Collars On The Market: What Really Works?